Maritime Profession of Arms in Dangerous Waters? RMKS/1. TRUST IS CRITICAL TO OUR NAVY AND I HAVE COME TO THE CONCLUSION THE HEAVY BURDEN OF TRAINING REQUIREMENTS HAS NOT ONLY ERODED THE TIME AVAILABLE TO COMMANDERS BUT HAS ALSO ERODED TRUST WITHIN OUR PROFESSION. USING SUCH A BUREAUCRATIC ACTION TO GET “CHECKS IN THE BOXES” DOES NOT ADDRESS THE ISSUES, REDUCES TRUST ACROSS OUR NAVY, AND UNDERCUTS THE COMMANDER’S RESPONSIBILITY. 2. AS SUCH, EFFECTIVELY IMMEDIATELY, I AM SUSPENDING ALL MANDATORY TRAINING REQUIREMENTS RELATING TO PERSONAL BEHAVIOR (TO INCLUDE ALL REQUIRED GENERAL MILITARY TRAINING). I HAVE DIRECTED THE CHIEF OF NAVAL PERSONNEL TO FORMALLY REVISE APPLICABLE INSTRUCTIONS ACCORDINGLY IN DUE TIME. 3. WITH THIS DIRECTIVE, I AM TRUSTING MY COMMANDING OFFICERS TO DO WHAT IS REQUIRED TO UPHOLD THE VALUES WHICH GUIDE OUR NAVY. ADDITIONALLY, THIS ACTION DEMANDS HOLDING PEOPLE APPROPRIATELY ACCOUNTABLE FOR THE ACTIONS THEY TAKE. THIS DOES NOT MEAN ANY FAILURE SHOULD BE DEALT WITH A HEAVY HAND BUT RATHER EACH CASE JUDGED ON ITS MERIT AND CONTEXT. THE INTENT IS TO DO WHAT IS RIGHT TO PROPERLY DEVELOP OUR PEOPLE, DISPEL THE ZERO RISK MENTALITY, AND ALLOW OUR COMMANDERS (WHO ARE BEST POSITIONED TO KNOW THEIR PEOPLE) TO PROPERLY GUIDE THEIR PROFESSIONAL DEVELOPMENT. THIS IS A COMMANDERS’ BUSINESS AND CAN NOT BE ENTRUSTED TO THE PENTAGON BUREAUCRACY. 4. TOGETHER, AS MEMBERS OF THE NAVAL PROFESSION, I AM TRUSTING EACH AND EVERY ONE OF YOU TO DO YOUR PART IN MAKING OUR NAVY BETTER EACH DAY. OUR FUTURE WILL BE DETERMINED BY THOSE WE LEAD AND IT IS THE LEADERS WHO MUST ENGAGE LEADERS TO MAKE THIS HAPPEN. I TRUST YOU TO DO THE RIGHT THING –NOW EXECUTE! 5. RELEASED BY ADMIRAL CHIEF OF NAVAL OPERATIONS. Although not a real directive, the time may have come for such a dramatic act of courage and leadership to repair the weakening trust within the Navy. The all-volunteer force has completed four decades of service and perhaps that transition was not properly executed. An overly bureaucratic military organization grown over time to train the masses of inducted service members with a “one size fits all” methodology has created an ideology that relies upon lengthy detailed procedures and extensive requirements rather than leadership and good judgment. Thinking and discretion of leaders on the deckplates became subjugated to the requirements and guidelines produced by the bureaucracy inside the Pentagon. The “2014 Navy Retention Survey”1 raised some somber issues regarding feelings and beliefs of individuals who responded to the survey (which can be extrapolated to the rest of the Navy and is statistically valid). Besides the usual concerns of feeling over-worked and undercompensated, the most troubling findings relate to issues of trusting leadership and aspiration to leadership. The executive summary of the survey reports “49.4% of responding Sailors do not want their boss’s job”2 – nearly half of the respondents. The report specifically highlights “an increasing belief that positions of senior leadership, especially operational command, are less desirable because of increasing risk aversion (68.7%) and high administrative burden (56.4%).”3 This should serve as a “RED SOUNDING”4 for the naval profession which is founded upon ultimate authority and command at sea. One of the unwritten aspirational values our Navy holds is that of “ultimate command.” When nearly half of the profession is no longer aspiring to such positions, the profession’s core tenets are being questioned which thereby endangers the profession itself. Combine this with societal findings of trust where 40 percent of baby boomers believe most people can be trusted, but for millennials, the belief is only 19 percent.5 A recipe for deep levels of mistrust within the organization exists. An equally troubling facet of this survey is an issue of distrust of Navy senior leadership. Almost half (46.7%) of the enlisted and nearly two-fifths (39.9%) of the officers surveyed distrust Navy senior leaders.6 Even more troubling was only a small minority (10.7% enlisted and 4.2% officer) expressing some degree of trust with the remaining majority of being unsure or undecided.7 This is hardly a strong vote of confidence in Navy senior leadership. What might breed such distrust within the ranks? The survey alludes that some of this might be from a perception the Navy suffers from “a significant risk averse culture and zero-defect mentality.”8 The survey’s author quoted a senior Navy leader at the Surface Navy Association as saying “We don’t have a retention problem.”9 By the end of the year the survey was released, then-Chief of Naval Personnel VADM Bill Moran stated the study was “useful” and acknowledged certain retention issues.10 The first step of the 12-step program is admitting you have a problem. As an example, look at how the Navy reacts to a bad example of behavior from what is claimed to be a very small fraction of servicemembers. Concerned with many behavioral lapses (sexual assault, fights, or discrediting conduct) being linked to alcohol abuse, the Navy instituted the use of breathalyzers to test members of this profession on a random basis.11 With sound bites from Navy leadership that the vast majority of our Service members are fine and outstanding individuals, such a reaction from the top does much to signal distrust of its members. This reflects the bureaucratic response of issuing new policy and instituting mandatory training for the masses. It is typical of the reactive response which tends to fire “accountable” personnel, implement a new policy, and mandate additional training requirements. These are the ways a bureaucracy reacts to such incidents as opposed to how a profession should be responding. Another sign of distress within the ranks relates to issues of honesty within the profession. A recent report about dishonesty in the Army12 shares many indicators of weakening honesty and integrity that are probably equally applicable to the Navy. Mandatory training requirements that exceed the time available pressures responsible leaders to “check the box” and stray away from the intent of the training. Training is a process (means) which does not always imply that learning is occurring (ends). The inability of members in the profession to say “no” in attempting to do more with less in a fiscally strained environment says much about the culture of the profession to be honest with itself. Many of these indicators were relayed in a very candid e-mail by ADM John Harvey just prior to his retirement as he addressed the surface warfare community.13 This four-star epiphany essentially serves as a confession of senior leadership failing the surface community with a bureaucratic push for efficiency and “doing more with less” while not listening to the rebuttal from the deckplates. With the repetitive use of the royal “we” nearly 80 times in this candid address, Admiral Harvey essentially admits leadership had failed the surface community: “When the assumptions behind the man, train, equip, and maintain decisions did not prove valid, we didn’t revisit our decisions and adjust course as required. In short, we didn’t routinely, rigorously and thoroughly evaluate the products of the plans we were executing.” He then went on to say, “And when we did gather together as community leaders, we did not get to the heart of the matter: our Sailors and our ships and their collective readiness to carry out our assigned Title 10 missions. I could have done better. We could have done better. 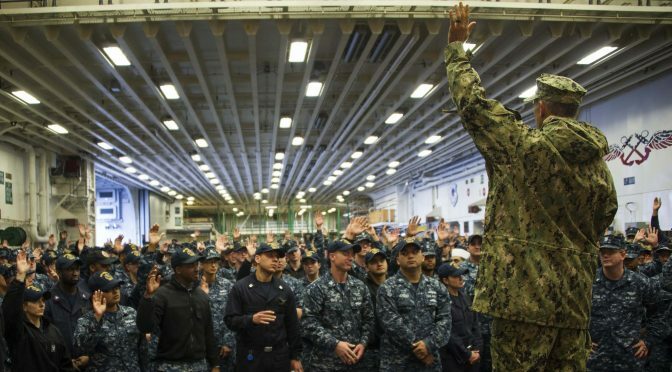 You MUST do better, because now we know better.” Although this message was directed to the surface community, it could readily apply to the broader issue of failure in the Navy. The Navy’s core values of Honor, Courage, and Commitment are more than just words or concepts. They must be guiding principles for the conduct its members. It requires moral courage to entertain the thought the profession might be trending away from what makes it a profession. It requires a moral commitment to the oath all members have taken to serve a higher cause – no matter how painful it might be. And most of all, it is the honorable thing leaders should do – trusting the people they honor as the most important asset. Actions speak louder than words, and a call for action by senior leadership to make leaders engage leaders is the only way ahead. This dangerous trend will not be corrected with more training and powerpoint slides. It is a leadership issue and requires having the discussions to restore the trust that is foundational to the strength of the profession, both within and external. Perhaps someday, the Navy may actually see a message similar to one which started this article, demonstrating courageous and candid leadership that would restore trust among the ranks. The question remains: will the uniformed leadership take up this challenge as stewards of the profession of arms or will bureaucratic tendencies prevail? The warning signs are there and it calls for living up to the Navy’s cores values of honor, courage, and commitment. Tom Bayley is a former Naval Officer who retired as a Captain in 2005, with over two decades as a nuclear submariner. He then joined the faculty of the U.S. Naval War College, where he is currently the Deputy Dean for the College of Operational & Strategic Leadership (COSL) and NWC’s Chief Diversity & Inclusion Officer. The views expressed above are his own and do not reflect the official views and are not endorsed by the United States Navy, the Department of the Navy, the Department of Defense, or any other body of the United States Government. 4. “Red Sounding” is a water depth limitation set to indicate imminent danger to the ship is present if nothing is changed. 6. “2014 Navy Retention Survey”, p. 18. 12. Leonard Wong and Stephen J. Gerras., “Lying to Ourselves: Dishonesty in the Army Profession,” Strategic Studies Institute and U.S. Army War College Press (February 2015). 14. Wong & Gerras, p.28.